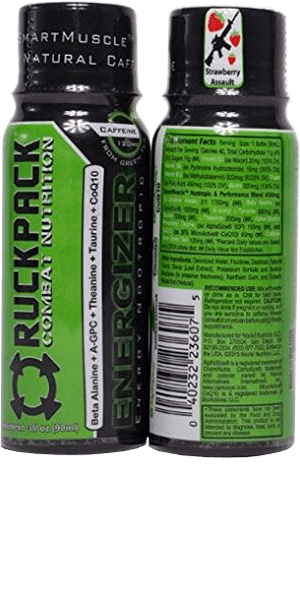 The Caffeinated RuckPack Energizer 3oz Energy Nootropic Shot is ideal for either a pre-workout energy & focus primer, or as a casual energy boost and brain enhancer for students and professionals alike. Unlike the competition, this brain-enhancing blend consists of natural flavors, natural colors, natural sweeteners, and 120mg of natural caffeine from green tea. No Sucralose.